This entry was posted in news and tagged motorsport RSR Motorsports on November 15, 2015 by James Day. 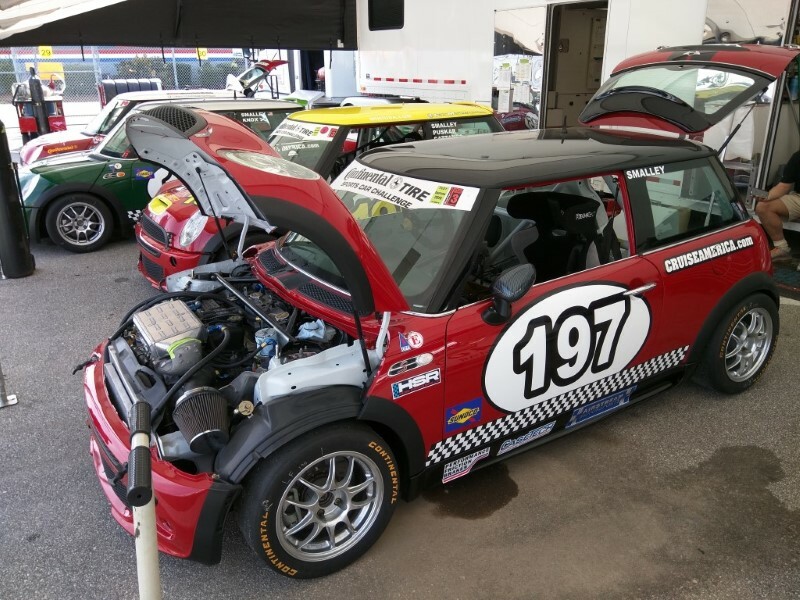 RSR Motorsports brought four of their GRAND-AM MINIs out of retirement for the 2015 Daytona Historics on November 13 and 14. Due to mechanical issues only two of the MINIs were able to race. Team owner Randy Smalley drove the non-factory BRG no. 196 MINI Cooper S (the former US LED car) in Race 1 on Friday afternoon while former MINI Challenge UK champion Chris Knox raced it on Saturday morning. Past RSR Motorsports driver Mark Congleton drove the Chili Red no. 195 MINI in both races. The MINIs raced in Group 3 in class SSC. In Race 1, Mark Congleton took the class win in the no. 195 MINI. Randy Smalley made the podium in 3rd place, despite having a transmission issue where the car would not stay in gear. He had to drive one-handed while holding the gearshift to keep the car in gear. In Race 2, Chris Knox finished 2nd in class behind the winning Mercedes-Benz 190E. Mark Congleton was less than two seconds behind Knox for 3rd place and a spot on the podium. There were some interesting results in the surprising performance of the old MINIs. Chris Knox posted the second-fastest lap that an RSR Motorsports MINI had ever done at Daytona, a 2:09.005 lap. Also on Saturday, they recorded their fastest-ever top speed of 147 mph. The four MINIs will return to their storage facility in Orlando. The Library of Motoring has followed RSR Motorsports since the beginning and we hope we haven’t seen the last of these MINIs on the track.